Z-CoiL changes lives with revolutionary, patented footwear technology. Each pair features open or enclosed replaceable springs in the heel and a built-in orthotic. The result is significant impact reduction while providing increased foot support and stability. Like shock-absorbers for the body, Z-CoiL’s enable you to walk, run, and stand for hours in comfort. ​They are extraordinary comfort shoes! Alvaro Z. Gallegos (Al)​ served in the Air Force as a test and ﬁghter pilot in the Korean War.​ His nickname was "Speedy." 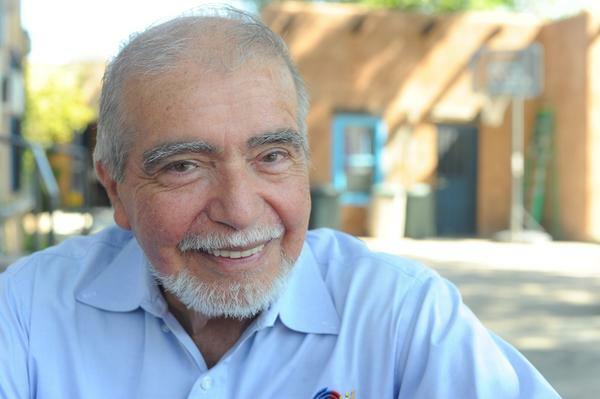 ​When he returned, Al and his father started a shoe store in Espanola, New Mexico. Al initially invented shoes with spring coils to address his own pain associated with injuries from decades of running. In 1995, Al’s son Andres, a pharmaceutical product manager in New Jersey, returned home to New Mexico to help open the Z-CoiL headquarters in Albuquerque.​ Al has been running in Z-CoiLs for over 33 years. When Al turned 80 years old he decided to participate in the Senior Olympics in the 100 metre run. At 86 years of age, Al still runs. 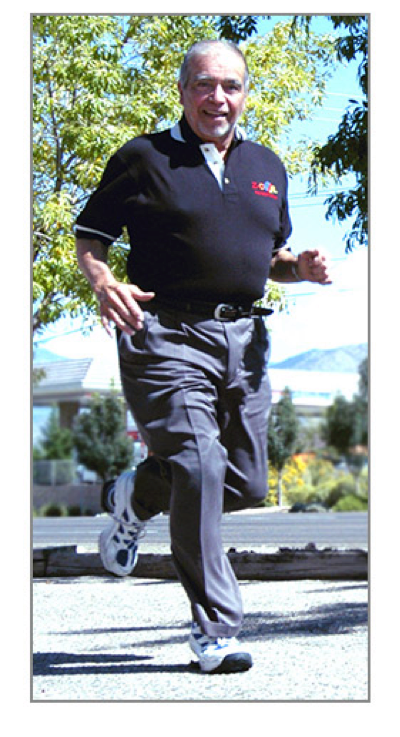 He competed in the New Mexico State Senior Games on July 21, 2018.​ Al is still actively involved with Z-CoiL operations. Over 1 million pair of Z-CoiL’s have been sold and are worn by many people you know like Dustin Hoffman, Helena Bonham Carter, Joe Walsh, Bill Clinton, Shirley MacLaine, Deepak Chopra and many more. The Z-CoiL Spring heel makes each step safer and softer. The unique replaceable conical coil design reduces impact significantly more than conventional shoes. Like shock-absorbers for the body, Z-CoiL’s reduce impact by 50% enabling you to walk, run, and stand for hours in comfort. Walking in Z-CoiL is unlike anything you have felt before. Some people describe the feeling like gliding. Each step feels easy, light and enjoyable. Your body will love the Z-CoiL Spring. Not only does the Z-CoiL Spring reduce impact, it can control over-pronation. Over-pronation is when your feet roll too far inward when walking or running. The spring can be adjusted in 90°increments to add more resistance to the inside of the foot, to correct over-pronation. Patented conical spring in the heel, which reduces impact by 40-60% (according to tests performed by the American Department of Energy) and provides energy return, reducing fatigue. Patented Z-Orthotic™ to stabilize tendons and ligaments. All elements of the shoe design work together to create the ultimate comfort shoe. Preventing stress injury and providing relief for existing injuries requires impact reduction - i.e., footwear that actually limits the amount of force that travels up the kinetic chain. However, cushioning impact alone will not ensure healthy joints and pain relief. Shoes that offer extra padding actually encourage atrophy in the muscles of the foot. Weak muscles can lead to a number of compensating movements, many of which direct stress forces to areas of the foot that are not designed to absorb impact. Unfortunately, most modern footwear has taken an either-or approach to solving the problem of increased impact along the kinetic chain. Either they provide cushiony soles to reduce the force of impact but allow the flexibility for soft tissues to move outside a normal range of motion, or they provide a rigid sole to keep the foot (and stress forces) in a natural range of motion but with very little impact-absorption, resulting in high impact all the way up the kinetic chain. Z-CoiL Footwear offers both: significant impact reduction and stability. Springy Feet's mission is to spread the joy of wearing Z-CoiLs. Springy Feet offers a 30-Day Risk Free trial where you can return the shoes in any condition for a full refund if you do not love wearing your Z-CoiLs. Copyright © 2019 Springy Feet.